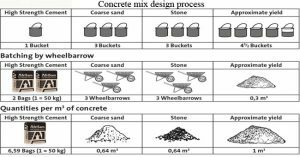 Concrete mix design is the method in which the correct components of concrete and its respective amounts are chosen in a way so that the concrete can provide the needed strength, durability and toughness. The overall performance of the concrete mix design relies on its two characteristics: plastic and hardened status. Plastic concrete mix design assists in two ways: compaction and placing of concrete. The hardened concrete mix design helps to provide strength to the concrete. The characteristics of concrete relies on many important aspects such as: quality of cement, quantity of cement, amount of water, batching and combining, placement of the concrete, compressing , and durability. But the incorrect mixed concrete may result to the shrinkage. In extreme case, it may develop cracks on the structure. The work related to concrete can result to a high budget economy. Therefore its budget highly relies on the cost of its components, production and labor cost. To determine the minimum compressive strength needed from the structure. The sufficient workability required for full compaction. To determine the maximum water and cement ratio to provide enough strength to the structure. To determine the maximum content of cement to eliminate the scope of shrinkage and cracking of structure. It is said that additives can be applied to change the workability, strength, durability, and robustness of the concrete. Similarly chemical mixtures, pozzolanic, and other such materials can be further mixed to change some of its characteristics or to create preferred characteristics.